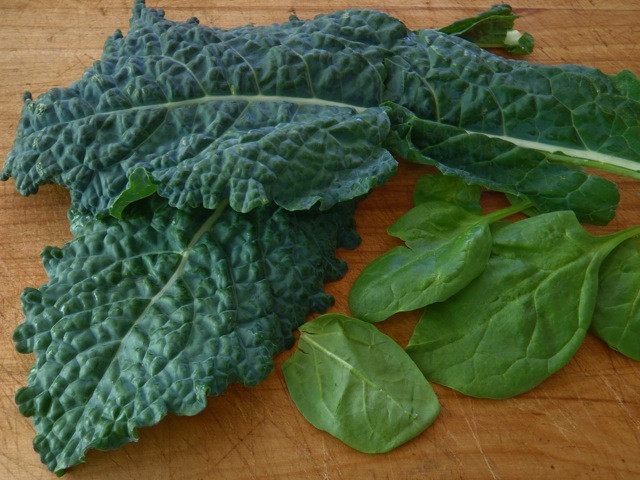 Getting Your Greens–by Dee | Angela M.D. I am so excited about spinach right now I can’t even stand it. It’s a beautiful sunny day in Florida and most normal people are excited about body surfing in the Gulf of Mexico. But I’m not normal, so I am happy that I just found two great ways to put spinach in my lunch. Keep this in mind when you get out your blender — can I add a handful of spinach? If it’s a margarita, the answer is no. But if it’s homemade fruit vinaigrette or a smoothie, throw it in. I made pear vinaigrette (one peeled pear, one orange squeezed plus the zest, a pinch of thyme, 2 T of pear infused balsamic vinegar and 1 T of olive oil). It was really good but when I blended in a cup of spinach it was even better. I bottled it up and went to get a bowl of bean soup for lunch out of my Crock Pot. Before ladling in the soup, I chopped up another handful of spinach. Pouring the hot soup on top caused the spinach to wilt, which is what I wanted. It added a pretty color to the beige soup and added a whole lot of health. Only 7 calories per cup adds half a day’s supply of Vitamin A, 14% of your Vitamin C, 5% Iron and a gram each of fiber and protein. Best of all, your mama would be so proud!